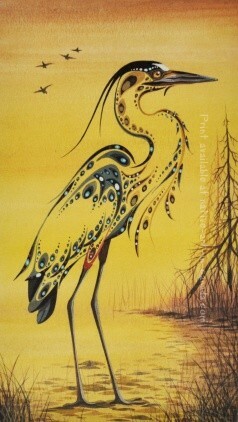 Ray Baptiste - "Blue Heron"
Ray Baptiste began sketching in the back of books as a child, and sold his first painting to a neighbour at age fifteen. Art remained a hobby for the young artist until a young woman took the twenty-something Baptiste to meet her father, artist Eddy Cobiness. Cobiness, who died in 1996, was one of the first Woodland artists and a member of the Indian Group of Seven. The older artist saw some of Baptiste’s sketches and encouraged him to work at his art and began a long and influential mentorship. “He was basically like a father figure to me,” said Baptiste. Adopted as a baby by German and Ukrainian parents, Baptiste knew very little about his First Nations heritage. Cobiness was a link to his roots. Ray Baptiste began experimenting with the Woodlands style, using swooping lines and dots to depict his subjects. “There’s enough there to get the idea of the animal, while still leaving a certain amount up to the imagination,’ he said. The three seasons he spent in the Yukon as a hunting guideinfluenced his work, but the real inspiration came from the time he spent with Cobiness around the Buffalo Point reserve. Aside from encouraging his talent, Cobiness also taught Baptiste the ropes of the business...including cold-calling corporate clients, selling paintings at mall shows, dabbling in graphic design, and doing anything possible to make a living through art. This included joining the Cedar Gathering collective along with artists like Sweetpea and Carl Fontaine. While it was a learning experience, Baptiste said the high pace eventually took its toll on both his work and his personal life. He eventually worked at home and developed a working relationship with Gary Scherbain of Winnipeg’s Wah-sa Gallery. “Gary took a lot of pressure off,” Baptiste said. His work was almost entirely sold and commissioned through the gallery, which specializes in original Woodlands art.